There’s a New Pittie in the Neighborhood! 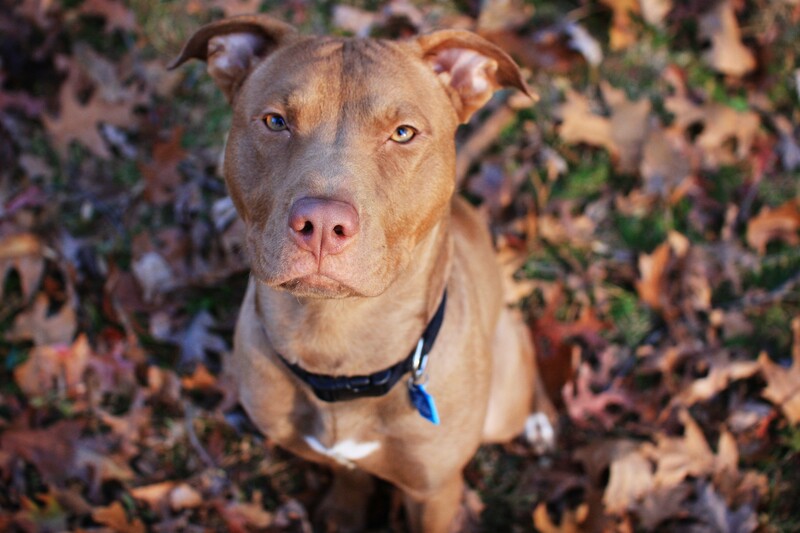 When my next door neighbors came to me saying they were looking into adopting a “pit bull” dog, I was elated. They are the kind of laid back people who don’t care about stereotypes and just wanted a nice family dog for their kids to grow up with. They headed to our local shelter and, after a slow moving search, finally found a pup that seemed to be the perfect match. 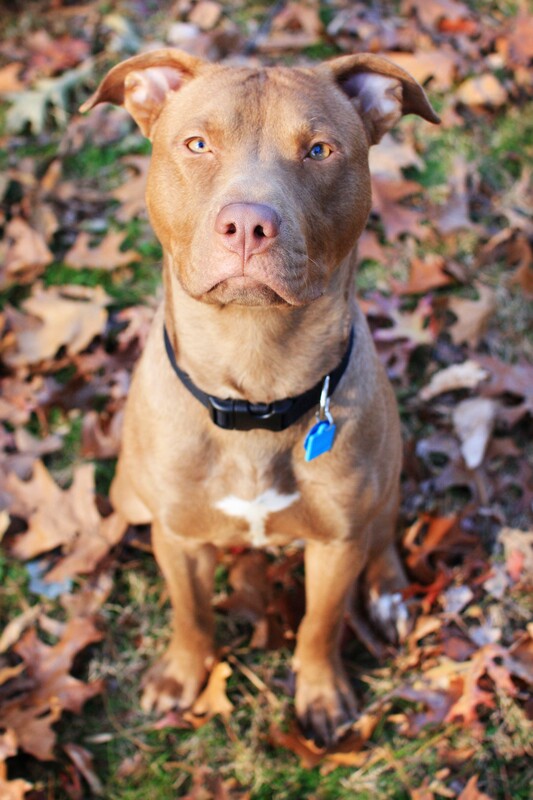 After meeting many dogs, they settled on handsome Rojo (pronounced Ro-ho). 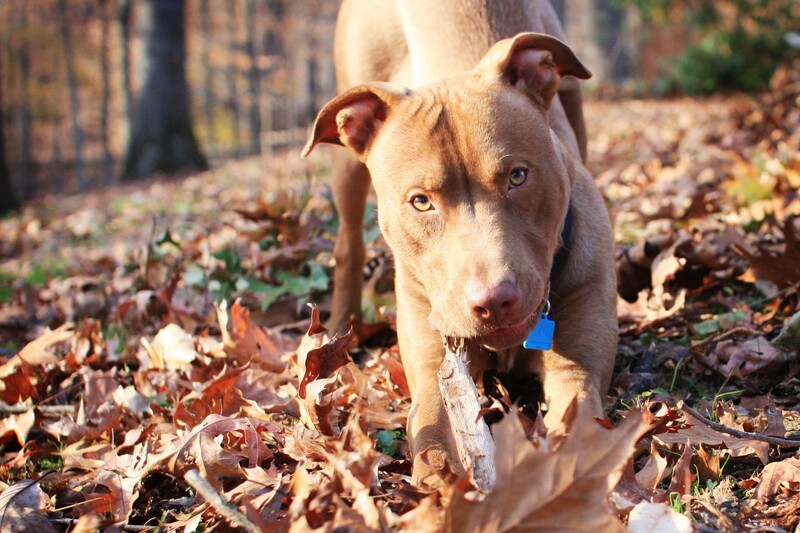 Rojo had been overlooked at the shelter for months because of his nondescript, brown-dog look. Even though he behaved like a gentleman during visits, he never caught anyone’s attention. Until this family stopped by and gave him a chance. Rojo now lives with two kids and has a huge yard that backs up to woods. He seriously hit the jackpot with this family. They’re so willing to accept him for who he is, and they’re ready to learn whatever they need to for him to be the best dog he can be. They lost their last dog about a year and a half ago, so naturally they are experiencing some, “Oh yeah, he’s not Scooter” moments, but they’re working through those. We all know how hard it can be to not try and replace our last pet, but to realize that the new one is an entirely new experience to fall in love. I have a feeling that Rojo will quickly turn into another beloved fur baby just like his predecessor. I’d like to ask you all for some advice on their behalf: Rojo is a pretty consistent submissive/excitable wetter. Do you have any ideas for curbing/curing that for me to pass on to them? Thanks! 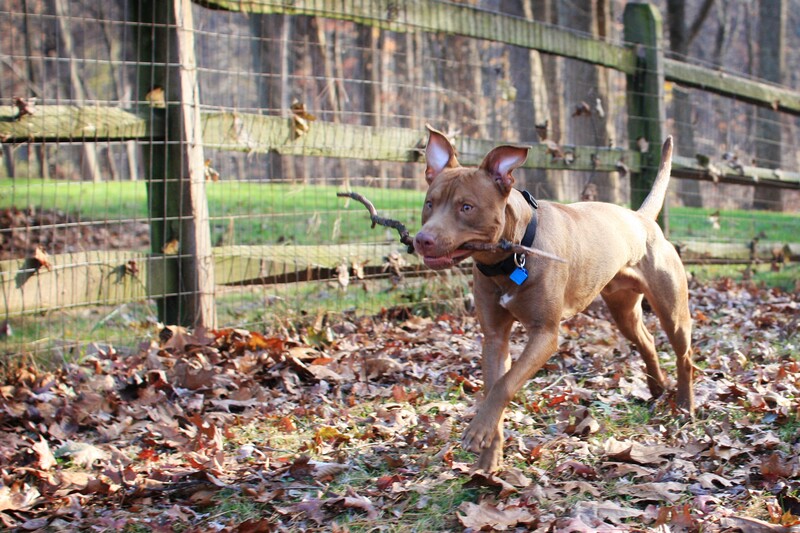 This entry was posted in Dog talk, Photography, Rescue/Humane Society, Uncategorized and tagged "pit bull" dog, ADOPTED, brown dog, excited wetting, forever home, new dog, positive training, Rojo, shelter dog, submissive peeing, training. Bookmark the permalink. Rojo is soooo adorable! So glad your neighbors rescued him. I will have to keep watch for tips on the excitement/nervous wetting. My foster dog does that also, most of the time when my husband first gets home from work. When I first or my pup, she did the same but eventually grew out of it. For the excitable wetting, we found that ignoring her when we first got home and when we did interact with her, not too get too excited or get her all riled up. Calm, low voices. Slow speech. When we pet her we found that if we do long strokes versus quick short ones, that helped to keep her calm too. Good luck and congrats to your neighbors on the adorable new family member! should decrease and eventually stop. Excited peeing and submissive peeing are very different in my opinion. We had fostered several Pitties and have seen both. The excitable peeing is already addressed with previous comments. If it is submissive then confidence building is a great start. Lots of walks will help and one of the best things would also be a good group obedience class. If it really is submissive I would pose 2 questions to Rojo’s family. Does he do it when meeting other dogs? Does he do it around any 1 particular family member? If they are not sure which it is then ask them about his body language when it happens. There is a potential that someone is trying to be Cesar Milan and dominate the dog. Cesar’s principles are great, dogs need rules boundaries and limitations and yes exercise, discipline and affection (in that order). They don’t need to be dominated, just led and respected. Let us know what the family says. Rojo is a handsome dude and I’m so glad he has a great home. Adjustments take real work and time. He sounds like he will be perfect with a bit of time an effort. A lot of good info here. I have read that you need to ignore the submissive peeing, just clean it up. If you make a fuss, that usually increases it. They will eventually grow out of it. It did take our Dakota about a year or so to stop. She still does it a little once in a while. Good Luck to Handsome Rojo! So handsome! Love when the go from happy-smiley faces to serious-grown-up dog expressions in the matter of moments! 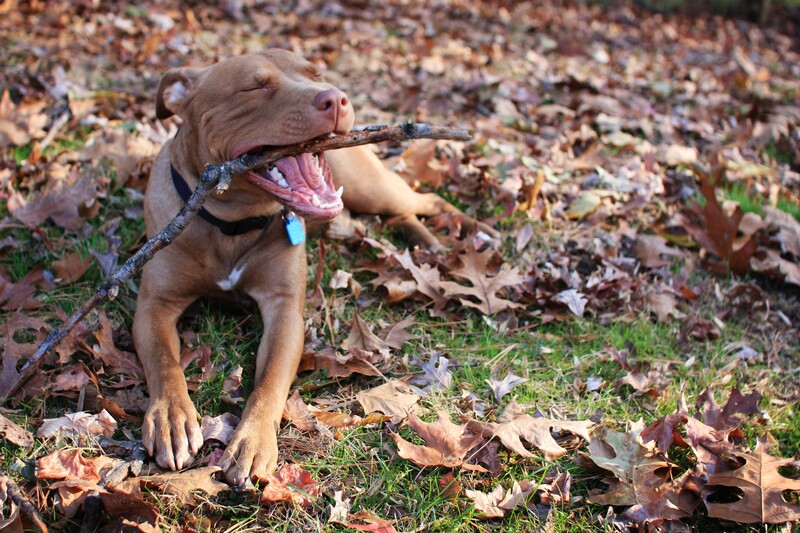 Your neighbors sound like great people and now have a great dog! Best of luck! When we first brought our pitbull home she was about 9 months old and would sometimes pee when excited. This would happen when meeting new people or dogs and especially at obedience class. She eventually grew out of it. I do agree with a poster above about keeping everyone calm when greeting. Gorgeous and what a sweet face! I don’t have any experience with excitable wetting so I can’t offer any advice on that. Congratulations on your new family Rojo! He sure looks happy! We got Luna when she was a year old and had never been in a home, only kennels. She wasn’t housebroken and a was a BIG excitement/submissive wetter. The submissive part went away after a few months as she got comfortable and learned that this was HER house and that we are a team. We were very careful to only train her with positive methods and not rush her so she became more confident. As for the excitement wetting we just have to ignore her when we get home (right when we get home is our biggest “pee danger” area). If we try to pet her or talk to her it’s too much. We work on being calm when we come in the house and staying mellow until she calms down. We then give her just a quick hello. As our training has progressed we’ve also learned that putting her on a leash when people come over helps her stay focused because she has learned that “leash = listen to the person holding the leash”. After 9 months with us she has gotten much,much better and we have minimal incidents now. Rojo is definitely handsome! Congratulations to his new family! The only experience I have with submissive urinating is with my brother in law’s dog when he was a puppy. He only did it around certain people and usually because those people got him over-excited. Fortunately, it was something he outgrew as he got older. Hopefully they will figure out what is over-stimulating for Rojo and get this problem solved soon. Rojo is adorable! He looks so nonchalant in the first photo and then bam! His personality shines through in the other photos! You are amazing. Look at all that wonderful information you got out to us because you *asked* for advice. I’ve learned a LOT reading the comments. Rose is a submissive pee-er (is that a word?) but as she’s grown more confident and with the help of obedience classes, routines, and structure, she’s improved greatly. With patience and love, Rojo will be just fine. What a handsome lad!! I can’t believe he was overlooked!